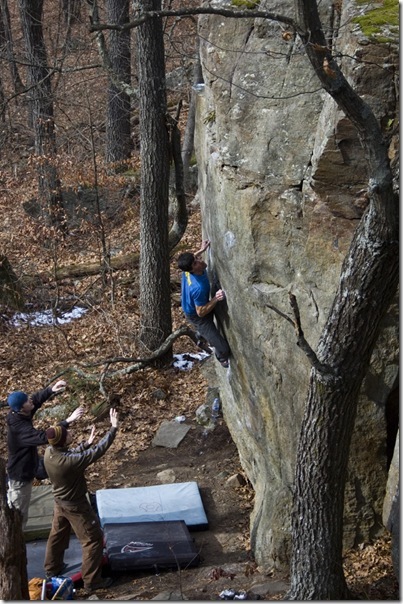 Over the past month, as Fall conditions have finally arrived here in Wisconsin, I have been slowly working my way through some of the harder problems at Governor Dodge in an attempt to get some fitness back. 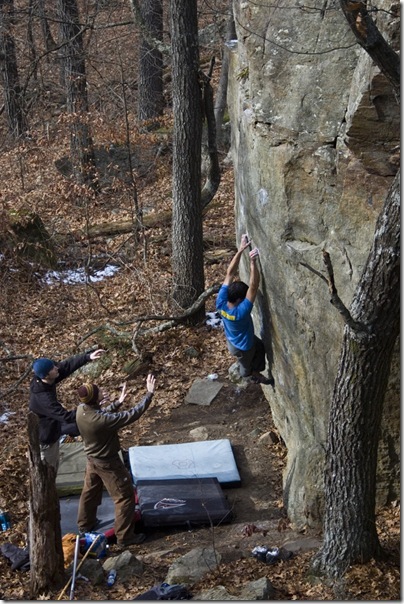 The end goal has been to repeat the classic problem Sandstone Violence (V8). I have been wanting to do this problem ever since I read about its FA by Jason Huston 2 years ago, and it is something I have been working toward throughout my entire rehab this year. 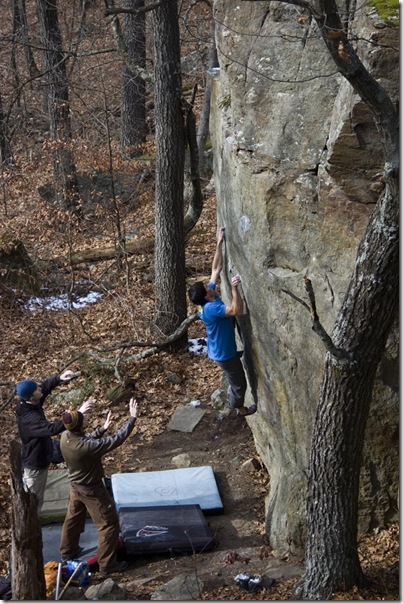 The problem Sandstone Violence has (in my opinion) the recipe for a perfect boulder problem. It begins and ends on a jug, climbs using 4 bad crimps and has a bit of height to it. The only negative thing that one could say about the problem is that one of the crimps is a bit sharp, but I digress. I first gave the problem some serious attempts a couple of weeks back and quickly worked out every move save for the last one. I returned this past Wednesday with fresher skin and the video of Nic’s ‘jump’ beta ingrained in my mind. After a couple of misfires, I committed to Nic’s beta for the last move and stuck the jug! While climbing a V8 is not impressive in the grand scheme of things, I was very pleased to climb something near my pre-injury limits. Hopefully this is a sign that 2009 will be a good year. Saturday was another fine day here in Wisconsin with temps in the mid-40’s, so I made the 2 hour trip out to the Dodge. 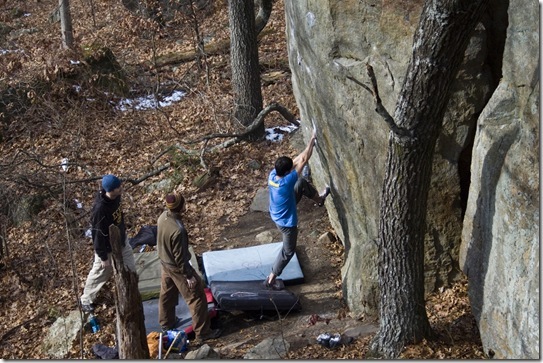 With no real plan for once, I met Chris, Jay, Kayte, Paul and John for a day of messing around on the boulders at Group Camp B. Chris and I both came agonizingly close to repeating Battle Of The Bulge (V7ish, unrepeated?) 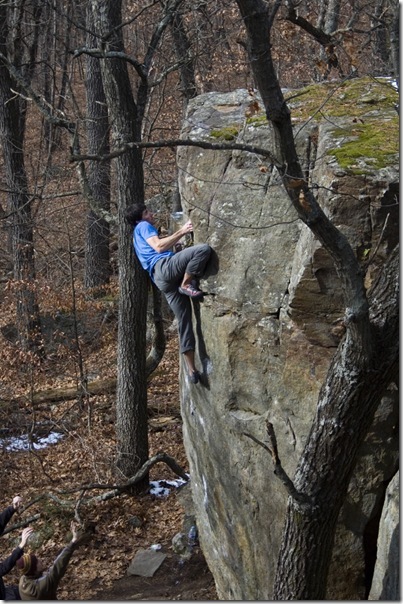 until I suffered a badly split tip on the problem’s incredibly sharp holds. I taped up to stem the flow of blood to give it a few more goes, but in the end I had to give up my aspirations of repeating it. Fortunately though, the day was not lost (see below). Thanks to Kayte for taking the pictures! Agreed. Great day. Good to meet you finally. Great photos! I should have also said that my perfect boulder problem has great moves in addition the other attributes I mentioned. This problem obviously has great moves. Ah, balancing the fine line between reporting and spray, well done, on all levels. uh.. you are pulling way to far “out” on the last picture and not “down”… that hold is delicate and needs some down not out attention. Very true, although 3 times of doing it that way and the hold still feels solid. I was trying not to think about what would happen if it broke as I would become a projectile flying into the woods. 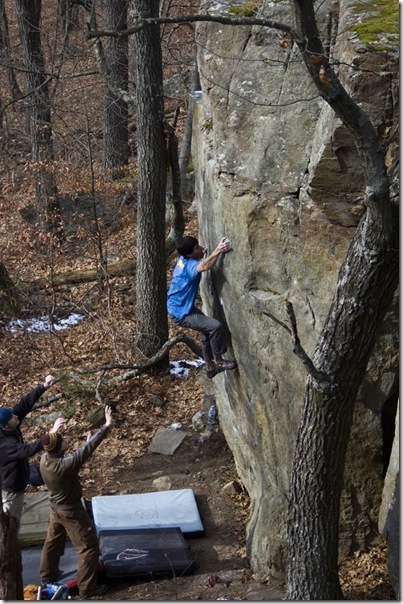 I will reevaluate beta if/when I am in need of topping out that boulder again. Congrats, Brian! Good work and cool pics. Thanks Jason. Major props to you for the FA…and all the other badass stuff you did while living in WI of course! Good to meet you too Paul. 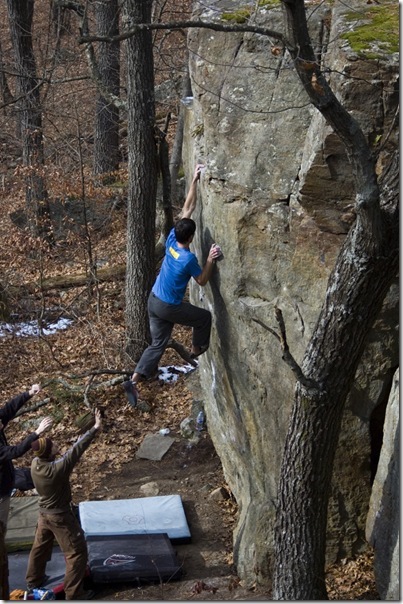 It was cool to see you almost nail the left crimp skipping the double pinches. Helps to be 6’7″ (maybe?). See you next time!